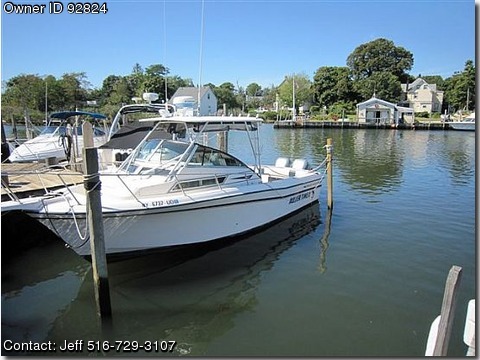 Boat is in excellent condition, and has always been yard maintained. All maintenance done and boat is ready to go. Garmin chartplotter, Furuno FF Lowrance FF/Chartplotter, standard VHF, Furuno radar, Stereo with new speakers,Lee outriggers, remote spotlight, 2 anchors, 2 sets of canvas, 2 sets of helm seats. All electronics 6 years old or less. 240 gal fuel will easily hit the canyons. Cruises at 30 mph and burns approx 18 gph. Great boat for cruising or fishing.